On Thursday, March 7, Jeremey Varley from Idaho State Department of Agriculture presented ISDA’s Noxious Aquatic Weeds’ Department’s plans for treating Curly Leaf Pond Weed in Hayden Lake. Standing-room-only greeted late-comers to the meeting, signaling the significant level of interest on the community’s part. 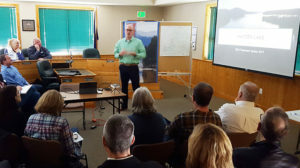 Attendees appreciated the early-release of the treatment plan information as well as the opportunity to ask questions and express concerns over weed management. Forrest Walker pulls up anchor, overloaded with Curly Leaf, in May ’18. What Chemical Will Be Used to Treat Weeds in Hayden Lake? Planned are applications of a chemical herbicide whose active ingredient is Fluridone. It takes the form of a slow, time-release pellet. The contractor, Aqua Technex will apply it in concentrations well below Fluridone’s safety limit. The Fluridone targets Curly Leaf and will affect the emergence of Milfoil as well. The history of this chemical treatment indicates that there will be Curly Leaf next year, but less of it. And, while slightly stunted this year, next year’s recuperation of the native species will be stronger. Lake-water use is a concern that impacts treatment decisions. ISDA selected Fluridone because it imposes no potable-water restrictions as long as the application rate is below 20 parts per billion (ppb). The planned application is 12 ppb at most, well below the maximum. There are irrigation restrictions: peppers and tomatoes are susceptible to the chemical above 5ppb, and all seedlings are vulnerable as well. Established crops are safe. To address this, they are targeting treatments at a time in the growing season when there is less water needed for gardening. A FASTest at each of 3 sites, once per treatment, will ensure the water is safe to use for gardening. When Will Chemical Treatment Take Place? Treatments will take place starting early May and will be repeated every three weeks for a total of three treatments. This treatment strategy gives the contact time needed for the chemical to penetrate the Curly Leaf plant system, including its turions. Its effect extends to the milfoil that is coming up behind the Curly Leaf. 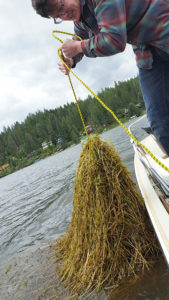 The next treatment phase will specifically target Milfoil and will take place in July IF surveys indicate the need. Where will the treatments take place this spring? Treatment will take place only in the North Arm area because that’s where seen the Curly Leaf was growing. Fall surveys of Mokins Bay did not reveal Curly Leaf in that bay. Treatments will follow the contours of the drop-off or shelf that separates the North Arm and the main body of the lake. How Does Curly Leaf Pond Weed Spread? Curly Leaf spreads in much the same way as Milfoil. That is, pieces of weed that break off when the water is agitated become rooted in the sediment at the bottom of the lake and grow. The small and buoyant fragments easily float to other areas of the lake. The dense, longer strands catch in motors, ropes, anchors, etc. so that boats easily carry them from one part of the lake to another. The weed requires shallow, warm water to thrive, so the shallower bays and shorelines quickly fall victim to either easily-spread species. Curly Leaf also propagates via turions which are small pinecone-like structures that float freely and plant themselves in the shallow lake-bottom. They are hearty and can lie dormant for great lengths of time, sprouting later under favorable conditions. What Other Questions Need to be Addressed? Jeremey.Varley@isda.idaho.gov. Please also share your questions here. We will find answers for you and publish them in future posts.